Tomorrow is International Literacy Day! This calls for some books we can really sink our teeth into. So, so pretty. That little ivy trail is the perfect touch. Or how about these classics? I've actually featured this cake before, but those covers are worth a second look. Seriously some of the best I've ever seen. And for more classics, how about a little Edgar Allan Poe? Creepy cool! Love the hand-painted raven. Happy Sunday, everyone! Here's to curling up for the rest of the day with a good book. Be sure to check out our Sunday Sweets Directory to see which bakers in your area have been featured here on Sweets! I love them all! I miss having shelves full of beautiful books, but alas, downsizing means sacrifices. Electronic readers are great, but there's just something about opening a new book, feeling the pages under your fingers, and the smell of the ink and paper that adds to the experience. Is the "My Adventures" book the little girl's scrap book in the movie Up? My first impression of cake #2 is that the topper looks like, well...a big pile of #2. Not the most elegant HP cake I've seen. BEAUTIFUL!!! Yay! ANYthing to do with books is right up my aisle! Very impressive selection, too! I think that my favorite Seuss is Green Eggs and Ham; it reminds me of my Mom's story about how my Dad made her green scrambled eggs on St.Patrick's Day while she was pregnant with me. That didn't sit well. (It didn't sit at all, really.The subject came up immediately after breakfast.) Books AND cake...What could be sweeter? Love this!! YAYYYYYY BOOKS!!!! Love the internet, but BOOKS FOREVER PLEASE! The shipwreck/octopus cake, unbelievable! And the Up cake, aaaawwwww! These are all breathtaking Sunday Sweets, Jen and John! (Looking forward to wrecks tomorrow, woohoo!). Thank you for all you bring to us!!!! Don't I wish I could curl up with a book for the rest of the day! I have FINALLY finished repairing storm damage from back in May, and am in the final stages of cleaning my house. Next week, it's yard work. @Amanda: Agree with you about the electronic books. Not quite the same. Lovely, lovely. That little fish in the bowl on top of the Suess cakes was my fave. I love the 3D effect of the gold pin on the Hunger Games book. And the adventure book from UP is adorable. Love me some books, but cake as books? Now that's something I can really get into! I'm raising my virtual hand! Love the Tolkien one, though all of these are beautiful. Impressive! And I love the idea of the book cake as a wedding cake! @mel; I love your impassioned reply! So very true...never too many books, always too little room!!! When I used to live in Sacramento I would go to the SPCA book sale they'd have twice a year, it was a HUGE tent full of books. When I'd take my son, we'd go to the kids section first and then he'd find a quiet corner and sit down on a box of books and proceed to wait for mom...he'd usually start getting impatient after an hour or so...in other words...he was GREAT! He'd see where we were headed and I'd hear a little sigh escape him, but he KNEW you don't come between mom in search of great books. I found more gems that way. Sadly I had to leave them all behind in Reno when I moved out here...but my sister has a good library, not nearly as extensive as mine, but it will suffice. Lovely cakes all around. I missed Friday's post on Friday, but by the time I read it last night, then all the comments, I ended up with tears and short of breath from laughing so hard. Love hanging with so many funny/ clever/ witty people! You guys rock! I want, no need the fishbowl from the Dr. Suess one.......and I love the happily ever after cake......next year is our 10th anniversary, and I think I just found the cake I want-now if the baker doesn't wreck it!!!!!! @Mel - Your comment was great. I would like to quote it online. If I may, how should I attribute it? I would really love for that description to go viral. As for the cakes, I'm not sure I could bear to cut into any of them, tasty as they might be. The Dr. Seuss cake with the fish bowl on top is just amazing to me! The books look so real and so well done! Bravo to whoever made that!! I would happily take the "happily ever after" cake as my own. I would love it and treat it well, I promise. I'd probably never eat it (too beautiful,) but oh well. You know what they say about having your cake and eating it too. Now I know that it's not just the first fifteen minutes of UP that make me cry, it's merely seeing a representation of Ellie's adventure book that will. Even a gorgeous cake one. Sigh. @Lady C: Thank you, that's very kind. If it is OK with Cake Wrecks, and I would ask john(thoJ) to chime in here, I would suggest something like: mel, as posted on the website Cake Wrecks. While I appreciate the attribution, I think the site should be acknowledged, too. Also, I have had to have a long discussion with my Autocorrect -- it has a way of changing the lower case "m" that I use for my name into an uppercase "M," but I post as mel, all lower case. Thank you again for your kind comment. Thanks! As a school librarian I think this is a perfect Sunday Sweets on my birthday! Check out the goodies served at various Edible Book Teas over the years by drooling over books2eat.com. It's an event that has happened for over 15 years, usually on April first, all over the world. @VaBeach alemaP: thank you. I am passionate about books. I, too, had to leave behind some books when I moved from NJ to IL – hundreds, in fact. Fortunately, I found good homes for them. My sisters are astounded by all the books I have. They say, “Hey, you’ve got three copies of this book.” Well, who doesn’t? Hardback, trade paperback, mass market paperback – and sometimes a signed copy. They took great delight one time in presenting me with a newspaper clipping about a man whose second story library fell in on him and crushed him, and said this is what would happen to me if I didn’t stop adding to my collection. (I took their concern very seriously and turned the stairs going to the second floor in semi-bookshelves – had to leave some room to get up there.) I usually have several books going at once, and will re-read old favorites. 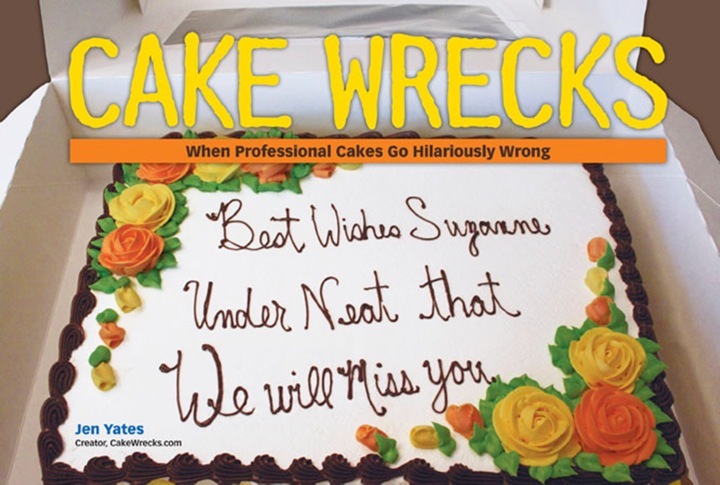 There are, however, two books that I am constantly rereading: Jen’s two Cake Wrecks books. They are on the nightstand and are a perfect way to end the day – with a laugh and a smile. The Dr. Seuss books are gorgeous! Also, I love the "happily ever after." That would be beautiful for an anniversary party too. I love the EA Poe cake. My 15 y/o dd surprised me when she bough a huge collection book of his, and proceeded to enjoy reading it! She was always a reader, but to switch from sci-fi, anime', and other age appropriate materials to Poe really impressed me. I might have to try to get that cake for her 16th. OMG OMG OMG OMG OMG OMG OMG OMG OMG OMG OMG OMG OMG OMG OMG OMG OMG OMG OMG OMG OMG OMG OMG OMG OMG OMG OMG OMG OMG OMG OMG OMG OMG OMG OMG OMG OMG OMG OMG OMG OMG OMG OMG OMG OMG OMG OMG OMG OMG OMG!!!!!!!!!!!!!!!!!!!!!!!!!!!!!!!!!!! long time lurker...LOVE so many regular commenters...you all make my day. you know who you are. pulled out of lurkdom by these SWEET reads! But...these are too gorgeous to eat!! @mel~ I "read" you...to coin a cliche (I can't put in a proper diacritic mark thingy on my ancient netbook thingy). The house I grew up in had several floor-to-ceiling, wall-to-wall, built-in bookcases-all full of books. My parents collected antiques, books, and antique books. Some days I feel like an antique myself, so things are coming full-circle. I grew up loving Steinbeck thanks to my Dad, and art thanks to my Mom. @Ginger, I'm with you--just a glance at the Adventure Book cake and I'm sniffling. Perfect representation. The CW family has so much in common, and clearly a love of books is one of those things. When I get nostalgic for the feel and smell of ink and paper, I pretend I'm on Star Trek:TNG, reading my books just like Jean-Luc Picard. Then maybe go visit the best used bookstore on the planet, which we are blessed to have in our small Texas city. It's a multi-story maze of books and people who love them; the perfect grownup playhouse. "Raise your hand if you grew up on this fantasy series"
It is so good to know that I am not the only person out there who appreciates and collects books. I finally found the perfect wedding cake, if I should ever get married, in the final cake of this post. Like mel, I also often have more than one copy of a good book, a hardback for my own library and paperbacks to lend or give away. Because I no longer lend out books if I only have one copy, unless it is to my sister, since I can go search her house to get it back if necessary. I just finished reading Zora Neal Hurston's book *Jonah's Gourd Vine*. Why didn't we read this book in high school instead of Hawthorne's *The Scarlett Letter*? I love it when the cakes are so good I almost can't quite believe they're actually cakes. Also, book cakes! Why have I not been asking my decorator friend for book cakes for my birthday every year?! I believe an error has been made in classifying the works of JRR Tolkien shown above as "fantasy." They are historical records. That is all. Last December I went to the conference kicking off the publication of the final volume of the Dictionary of Medieval Latin from British Sources, 100 years after the project first began. They had the most awesome cake for tea. Alas, I don't see any pictures of it in the post-conference picture posts on the DMLBS blog, but I can share the one I took -- alas, only after it was partly eaten! The cake was done by a local bakery in Oxford, I don't know which one. Wow, these cakes just make me smile. Especially loving the Tolkien books and the happily ever after wedding cake. Happy reading! September 8, 2014 | Laura P.
I know I'm late to the comment party on this one, but just want to mention that a great option for book lovers with small spaces is their local public library. Not only for filling the role of being your book source, but also for when you're needing to pare down your collection... most libraries welcome donations that are either added to their collections or are sold to help provide funding. As a both a former school librarian and public library employee and a lifelong book lover, I too, approve of this post. :) So lovely! Surprised Vin Diesel's birthday cake wasn't on here. Stacked D&D books so perfectly done. Maybe she's saving those for a geek inspired sweets.